Benedictine Sister Mildred Wannemuehler, a former prioress of the Sisters of St. Benedict of Our Lady of Grace Monastery in Beech Grove and former longtime parish life coordinator of St. Agnes Parish in Nashville, died on Aug. 1 at the monastery. She was 82. The Mass of Christian Burial was celebrated on Aug. 4 at the monastery chapel. Burial followed at the sisters’ cemetery. 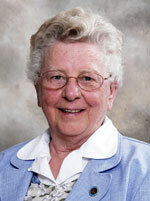 Benedictine Sister Juliann Babcock, prioress, said Sister Mildred was a gifted teacher, principal, pastoral administrator, spiritual director and retreat presenter during 63 years of religious life. Sister Mildred utilized her teaching and leadership skills in her ministries at parishes as well as at the monastery, Sister Juliann said, where she served as formation director then as prioress for eight years. As one of the early parish life coordinators in the archdiocese, Sister Mildred enjoyed serving the people at St. Agnes Parish in Nashville. In the archdiocese, Sister Mildred also ministered at St. Anthony of Padua Parish in Clarksville and the former Our Lady of Grace Academy in Beech Grove. Lucille Matilda Wannemuehler was born on March 16, 1930, in Evansville, Ind., and entered Monastery Immaculate Conception in Ferdinand, Ind., on Sept. 7, 1947. She was invested with the Benedictine habit as a novice on June 7, 1948, then made her first monastic profession on June 13, 1949, and perpetual monastic profession on Aug. 10, 1952. She became a founding member of the monastery in Beech Grove in 1960. Sister Mildred earned a bachelor’s degree in education at the former St. Benedict Normal College in Ferdinand, Ind. ; a master’s degree in education at the University of Notre Dame in Notre Dame, Ind. ; a master’s degree in theology at St. John’s University in Collegeville, Minn.; and a master’s degree in spirituality at Holy Name College in Oakland, Calif.
She ministered as a teacher and principal as well as a junior director, novice mistress and prioress at the monastery then as a pastoral associate and parish life coordinator. Sister Mildred served her religious community as formation director and then as prioress from 1977-85. In 1986, Sister Mildred began her ministry as parish life coordinator of St. Agnes Parish in Nashville, where she served until her retirement in 2005. She celebrated her 60th jubilee on June 21, 2009. Shortly before her death, she wrote a book, The Real Color of Nashville, about the people of Brown County. Surviving are a sister, Ruth Weekley of Mogadore, Ohio; and two brothers, Lee Wannemuehler of Holmen, Wis., and Gil Wannemuehler of Evansville, Ind.